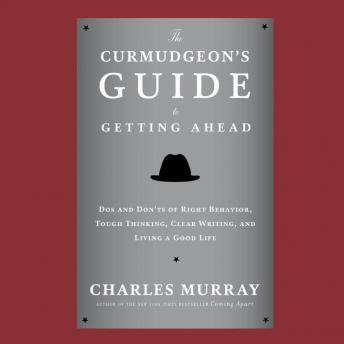 Bestselling social historian Charles Murray has written a delightfully fussy—and entertaining—book on the hidden rules of the road in the workplace—and in life—from the standpoint of an admonishing, but encouraging, workplace grouch and taskmaster. Why the curmudgeon? The fact is that most older, more senior people in the workplace are closet curmudgeons. In today’s politically correct world, they may hide their displeasure over your misuse of grammar or your overly familiar use of their first name without an express invitation. But don’t be fooled by their pleasant demeanor. Underneath, they are judging and evaluating your every move and utterance. And in most cases, if you want to advance in your career, it is their approval you need to win. In the course of this pithy and powerful book, Murray tells us the proper etiquette for email, how to stop using such overused and fuzzy phrases as “reaching out” and “sharing,” his thoughts on piercings and tattoos and proper dress, the importance of rigor in language and good writing, why being judgmental is good, and other curmudgeonly pieces of wisdom and advice. He suggests how to stand out at work (work long hours when you are young and unencumbered by family and other obligations), when to use strong language and when to avoid it, and offers a bare-bones usage primer on how to avoid confusing words like “advice” and “advise,” which look or sound similar but have distinct meanings. Written with both verve and reserve and drawing on the core values that have historically made good manners the best lubricant to social and professional advancement, The Curmudgeon’s Guide to Getting Ahead is an invaluable resource for anyone hoping to land the job of their dreams—or get ahead in their career of choice.